Mrs. F.A. Olsen “hurled her baby and carriage” in front of a moving car, according to the San Francisco Call Bulletin. This striking—perhaps staged—photo marked the climax of the Berkeley garbage war of 1908, a brief, bloodless skirmish in which local women successfully took up arms to prevent the city from dumping its trash in their backyards. Oddly, despite its cast of gun-toting, baby-hurling, proto-environmentalist mothers, the conflict has been all but ignored by histories of Berkeley. Unsurprisingly, this was not popular with people who lived by the bay. In late February 1908, armed residents of Contra Costa County chased off Berkeley scavengers dumping trash just over the county line. Shortly afterwards, the city made a deal with West Berkeley trustee George Schmidt to dump on his shorefront property at the foot of Gilman Street in the Ocean View district. The following evening, the Berkeley trustees repealed an ordinance banning dumping within 500 yards of a residence, giving the scavengers the right to dump anywhere in city limits. “These garbage men will discover that we are all fighters before they finish up the matter.”Yet the roads into Ocean View remained blocked, and more than 150 tons of trash accumulated in Berkeley, including in the backyards of “the fashionable members of the hillside set,” as the Call recounted beneath the headline, “Garbage is Piled High in Berkeley.” The Chronicle reported that the owners of one hotel were “at their wits’ end,” having been forced to burn their rotting trash in a vacant lot in the center of town. The final showdown took place April 1. The Chronicle reported “a band of nearly fifty citizens, most of them women, and all armed with shotguns, revolvers, clubs and clods of earth” assembled just outside the town line at the intersection of San Pablo and Buchanan, again reinforced by “a host of small boys ready to throw rocks at the horses.” The Gazette, which took a dim view of the anti-dumping campaign, described a “mad mob” headed by four women from the Protective Association, all “armed to the teeth.” With cries of “S’help me Jolly Roger!”, the “hoodlumists” prevented any garbage wagons from turning west toward the shoreline. Photos “from the dead line for scavengers” in the San Francisco Chronicle may have been posed for dramatic effect. A woman chases away a garbage dumper in this cartoon from the San Francisco Call Bulletin. The Chronicle and Call’s colorful accounts of the day were later questioned by W.M. Wright, a member of the Protective Association who lived at San Pablo and Marin. He told the Gazette that “The papers have greatly exaggerated our little fiasco out here. There is absolutely no truth in the report that one mother attempted to throw herself and her child in front of an automobile.” Also, he insisted, “It is true that some of the women became excited and did have guns at first, but all of the pictures that appeared in the San Francisco papers were arranged by the reporters, who had the women strike that attitude just for the sake of getting a picture.” Considering that both papers rarely ran any photographs more exciting than portraits (the Gazette had no photography at all), the suggestion that the photos were set up seems entirely possible. The following day, a judge issued a temporary injunction prohibiting any dumping 1,000 yards north or south of Buchanan Street, and the garbage war came to an end. 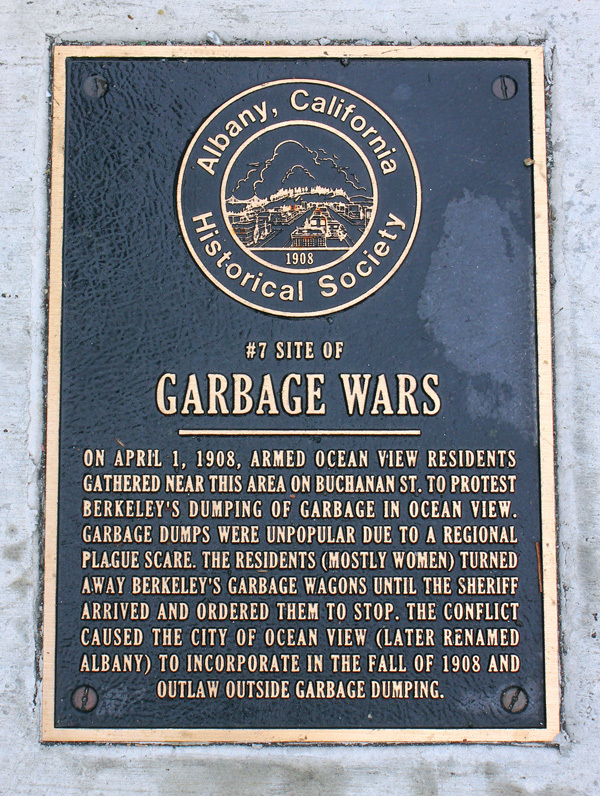 Though there were no further incidents of armed resistance to trash dumping, the rift between Berkeley and Ocean View did not heal. On Sept. 15, the western part of Ocean View officially seceded from the city altogether. The newly elected trustees of the breakaway town, which would be renamed Albany in October 1909, declared that their first order of business would be to ban all garbage dumping within city limits.